Thankfulness is something that’s better modeled than taught, I think. I have noticed with my oldest that even defining and explaining thankfulness was really hard, almost abstract. So when he caught me counting my blessings, especially when I was disappointed, I discovered that taught him what thankfulness is. The notion of a blessing jar is not new and I’m not claiming this idea as mine. But perhaps my little idea of how to use it with my kiddos will unearth a good idea that you could put into practice in your home. We are starting a new school year here and thought it was a good time to start the blessing jar. We will open the jar on the last day of school and spend time enjoying God’s faithfulness and goodness as we reflect on the year. There are dozens of ways I’ve seen this sort of thing done, so I’ll just give you my plan, give you some other ideas and update you on how it’s going with us. Here is our simple little mason jar that my kids decorated. Now surely, I could have picked up the chalkboard stickers and marker and made it look all cute like I wanted and you all could pin in on a “certain site” we all know. Maybe it’s just my kids, but if they have ownership and creativity with something I want to implement, the cooperation goes up like 10 times! So I let them make the label and decide what special paper (if any) we would use to record our daily blessings. As a family, usually at supper or shortly after, we discuss our daily blessings. Then, we will ask the kids what we should put in the jar. I thought that it would be fun to use a special pen and papers, but you could certainly use an scrap paper you have. I have also created a printable with prompts and tips if you’d like a little help getting started. Modeling thankfulness in day occurrences is essential. Not everyday will they have those monumental moments that more easily yield a thankful spirit. So, it’s extremely helpful for kiddos to see Mom and Dad list things like safety, health, togetherness/quality time, Divine help with a difficult work task, a favorite meal, etc. I hope this help them understand some blessings are only “simple” because we rate them that way. They are ALL God’s undeserved goodness to us and ALL worthy of praise. Doing this daily through a school year helps to develop a habit. Perhaps we won’t have a physical jar every year, but maybe just the daily supper discussions. However, I thought the task of writing and the ability to see the stack of blessings grow inside the jar was especially helpful now for my age of kiddos. They learn by doing, not just talking. 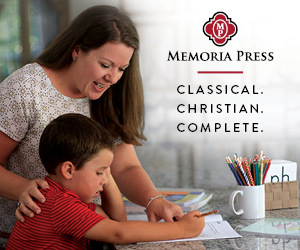 Psalm 90 encourages us to have a good spiritual memory – and this will help! I look forward to seeing a sense of awe in my kids as they, Lord willing, grasp the goodness we’ve been showered with in a matter of months. I am trusting that the lessons of thankful living with yield comfort, stability and perspective when their days are hard. It is so encouraging to hear thankfulness instead of complaining. I like to think that the family who praises together, stays together. I’m not talking about just remaining intact as a family unit. I’m talking about wanting to be around each other! When our family spends time talking this way, it only builds and strengthens our unity, love and desire to be together! Now it’s your turn. Tell me if you do something like this in your home. How do you do it? Download a free Blessing Jar Guide printable and give me your feedback below!